The Dôme du Goûter is one of the larger summits of the Mont Blanc Massif. It is the shoulder on the way to the summit of Mont Blanc. 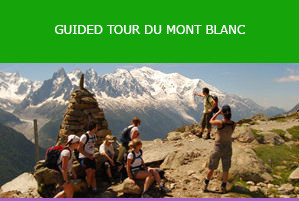 The Dôme du Goûter is not part of the Tour du Mont Blanc, but can be seen from the TMB trail. 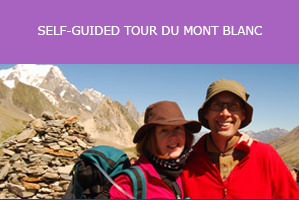 It is 4304m high and Mont Blanc is 4808m high. Only climbers or Alpinists will make their way to this peak en-route to the summit on Mont Blanc. From the Chamonix Valley it is easy to mistake the Dôme du Goûter for Mont Blanc as it looks higher due to the perspective. Mountaineers climbing Mont Blanc will often stay at the Refuge du Goûter. This was newly built in 2013 and is a beautiful stainless steel structure with triple glazed windows. It replaced the old refuge that was damp and over-crowded.